As a kid growing up I went to church camp overnight only once in my life when I was about 10 years old. I have to admit it was one of the best times I've ever had. We got to get away from home and spend time with my friends, I met so many new ones and got to know the ones I would see at church but not talk to a bit better. I learned so much those two weeks, trusting the people looking out for us and becoming a bit more independent. This was the longest I had ever been away from my parents and after a few days I was starting to miss them, but talking with my camp leaders and letting them know how I felt helped me get through it. The songs, the food, the companies and the activities were all great. After coming home and sharing my experience with my parents and siblings my parents made sure each of my siblings got to go to camp at least once as well. Not only that, we as a family went camping several times a year during the summer. This made our family so much closer. I look forward to one day sending both my little ones to camp, I know if I do it at least once in their life they'll have a great experience like I did. This is why I entered Pioneer Camp's contest they have going on right now to maybe win a free trip for myself and a camping trip for one of my kiddos. 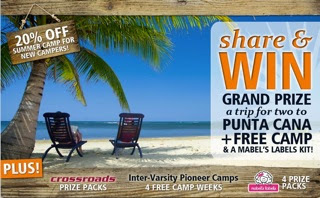 If you're interested or thinking about sending your kid(s) to camp, check out Pioneer Camp and see what they have going on, while you're there be sure to enter their contest and you may be able to win a trip for yourself along with free camp stay for your kiddo, it's easy to enter! Once the participant enters the contest they will receive one ballot / contest. The participant can receive more ballots by sharing their contest PURL(s) with their online connections. There are 3 easy share buttons at the end of the entry form; Facebook, Twitter and Email, but any and all social channels can be used. They will just have to cut and paste their PURL(s) where they want to share it. Your friends may receive an email with your unique link. The more people that sign up from your PURL, the more extra ballots you will receive. Once done you will get to pick from the following Bonus Offers and print the coupons you want. The coupons will also get emailed to you in case you don't want to print them out right away. Contest Period: March 21, 2012 at 12:00 a.m. EST (“Eastern Time”) and ends on June 15, 2012 at 11:59 p.m. EST - Canadian Residents Only (excluding Quebec). Disclosure: All opinions are my own. I am a Pioneer Camps & Circle Square Ranch Camp Ambassador, this post has been compensated.